Unfortunately, I didn’t have a chance to see Spring Awakening in New York during its original Broadway run but when the show went on tour I made sure to get a ticket at its stop in Toronto. Being a student at the time, I purchased the cheapest ticket available which put me in the last row of the Canon (now Ed Mirvish) theatre. For a show that embraced intimacy with the audience, I felt very disconnected being so far back and was not looking forward to seeing the show at the distance I was. In a lucky turn of events, two people who bought stage seats (as seen in the video, the show’s design included bleacher setting on either side of the stage) did not show up in time and the ushers reached out to the sad folk in the last row to replace them. After literally running through the theatre onto the stage in about three minutes, the lights came down and the show began. As the show concluded, I was a weepy mess. At the time, it was the most moving and relatable show I had ever seen and encapsulated so much of what I was experiencing as a first year university student. While my experience was unique being able to sit onstage as a part of the action, I do believe the show holds up on its own with a strong book, infectious score and beautiful (though sometimes nonsensical) lyrics. At the 2007 Tony Awards, the show won big with 8 awards including Best Musical, Direction, Book, Score, and Featured Actor for John Gallagher Jr. While the show’s more profane lyrics were rewritten for the telecast, its medley performance still gives a viewer a sense of the raw and energetic t nature of the show. 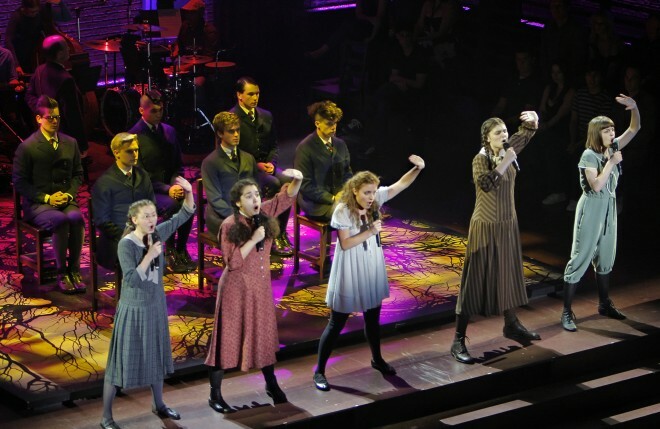 Spring Awakening will live on as a theatrical highlight in my life and I look forward to the next show to grab the attention of young audiences as much as Spring Awakening did.